There we were—five men looking at a stack of old used pallets. The old pallets had been pressure washed, but they were still rugged looking and dilapidated. 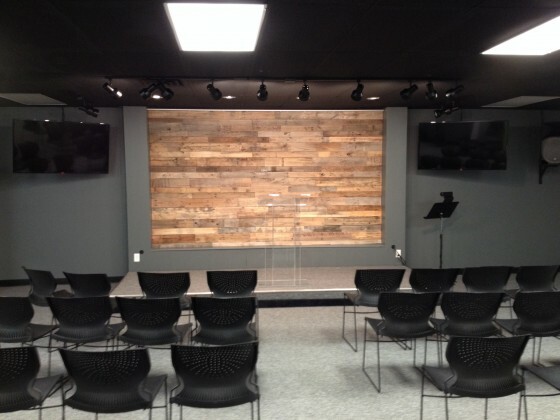 Our mission was strip the wood from these pallets so we could use them on a wall at Truth Fellowship Live. As we started the process, we felt skeptical that the pallets would produce anything useful for us. Much of the wood split while we attempted to take the pallets apart. The comment was made several times that this might not be worth the effort—after all, the pallets were old and the wood filled with nails and other blemishes. How could such ugly and rotten material ever have a useful purpose? Yet, when we finished collecting the wood and brought it to TFL, the process began of selecting the appropriate sections of wood and mounting it to the wall. In the end, the result was a beautiful wall that worked well as a backdrop on our speaker’s platform. We went through several steps in this process, which began with these dirty, useless pallets. First, the pallets were cleaned. 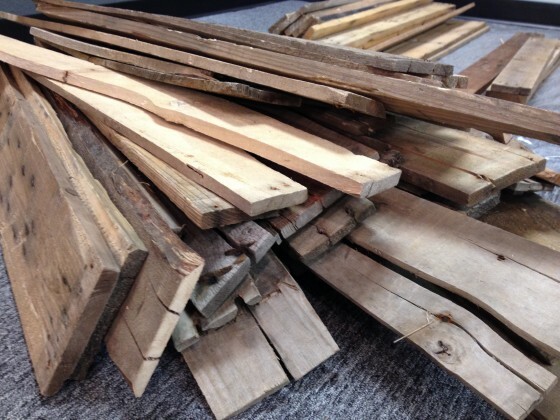 Then, we stripped the pallets down to the bare lumber and we selected the wood we wanted to use. Third, we brought the wood to the church and sorted it by width and the best pieces were selected for the wall. The fifth step was to trim the nail-ridden ends of the boards so we had clean, sharp edges that would fit together well. Finally, the boards were mounted to the wall to produce a perfected wall. In the end, we only used about one-third of the boards—the remainder was mostly scrap and needed to be discarded. Yet, the job that looked hopeless at the beginning ended up providing a beautiful wall. The wood was repurposed and what seemed to be trash ended up being used in a wonderful way. It seems like God takes similar steps with us; He takes a life that is meaningless and lost and makes a new creation that is perfect and useful in His Kingdom plan. He uses many of the same steps we used in building our wall. Consider Eph 2:1-10. Our natural condition—our initial condition—in this world is that we are hopeless, lost, and useless to God. Man’s initial condition is that we are dead in our sin. We walk according to the course of this world. The death here is not physical death—we are very much alive; rather, the death is spiritual. Because of our spiritual death, we cannot have any fellowship with God. Man is separated for all eternity from the living God; he is not useful to God; rather he is dirty and scarred. Because of His great love, God in His rich mercy made us alive. God saved us because of His grace. In essence, God power-washed us. He stripped all the mud and debris that we accumulated during our worldly living. He made us clean (John 15:3). This type of cleansing can only be accomplished by God reaching down to us, i.e. Him choosing us (Eph 1:4; 2 Thes 2:13-14). But we must respond to His calling. By faith in Christ and Christ alone we trust the gift that God has provided. But for what must we trust Christ? There must come a point in our lives that we realize that we are sinners and require salvation from that sin. Then we must depend on Him alone to forgive us and for Him to give us eternal life. Our trust must always be in the free-gift of God to us. Eph 2:8-9 says, “For by grace you have been saved through faith, and that not of yourselves; it is the gift of God, not of works, lest anyone should boast.” There are many good activities for us to do such as going to church, helping the poor, being a good person, but none of these brings us back into fellowship with God. We must trust in Christ alone to be cleansed—to be power-washed. Once a person has trusted in Christ that person has eternal life and will spend eternity with God. But God is not finished with His construction project. Each person that has trusted in Christ should now go through the process of becoming useful for God’s purposes. In our construction project, we transferred the wood to a new location, determined how the wood should be used, and began trimming the ends to get rid of the scars from the nails. God’s goal for each believer is that we become living sacrifices—holy and acceptable to God. He also says we should be transformed by the renewing of our minds. Then we will be able to be used for God’s purposes. As with our wood, which need to have the scarred ends trimmed, God needs to trim the scars from our lives so that we are can be presented holy before a holy God. Christ died for the Church so that that He might present her to Himself a glorious church, not having spot or wrinkle or any such thing, but that she should be holy and without blemish (Eph 5:27). God is about removing all the blemishes from our life. Yet, as seen in our wall, the imperfections and scars are still abundant. Even with the scars still showing, the lumber for our wall was aligned so that it looked great on the wall and fulfilled the purpose for which we intended. God does that with each of us. Even in our weaknesses, we become useful to God’s purpose. Jesus said, “My grace is sufficient for you, for My strength is made perfect in weakness.” God is able to “repurpose” us in this life. But we must be willing to be changed into what God intends. This means, our “will” must become God’s “will.” This was brought out in the message by Pastor Terry this week. From our study of Luke 2:39-52 we learned that the study of and meditation upon God’s Word is a necessary part of every Christian’s everyday walk. Are you deeply involved in knowing God’s Word and understanding it so that you can live accordingly? Then we were asked a penetrating question. If God were to ask you, “What are the activities and pursuits of your life that you would consider “God’s business”?” What would you answer? Jesus was about His Father’s business when He was only 12-years-old. How about you? Are you about your Father’s business? God wants to take our scarred lives, trim them, and repurpose them so that we can serve Him according to His design. God’s intent with our lives is to make us into a new creation (2 Cor 5:17). Are you ready to be repurposed so that God can use you? No Replies to "The Remarkable Transformation"